At Stephen’s C of E First School we are proud to be a distinctly Christian Church school serving a diverse cultural community. Our curriculum is rich and exciting using mantle principles to guide learning. Our values ensure pupils learn to be honest, respectful citizens who care for one another and our planet. Our motto, Aim High Reach for the Sky, is continually reiterated to encourage our children to achieve and flourish. We are a happy school with dedicated staff who work hard to meet the needs of all our pupils. 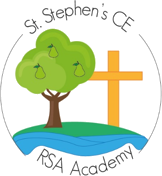 At St Stephen's C of E First School we are committed to the Christian ethos - that every child is special in the eyes of God and we teach that all people should love, care for and respect one another and our planet.